The 2016 Mercedes-Benz Sprinter - the commercial van that launched many imitators - will help your business always be ready for the road ahead. With tons of options to custom fit to your business's needs, the Sprinter is the most advanced commercial van on the road today. Imagine a fuel-saving, 2-stage turbo diesel engine, Best-in-Class payload, cargo volume, interior standing height, available 4x4 drive train, advanced safety features and legendary Mercedes-Benz reliability that will help drive your business to success. Visit Mercedes-Benz of Tacoma today to see the finest lineup of commercial vans and vehicles that are perfect for any business. The hardest-working van now works even harder. 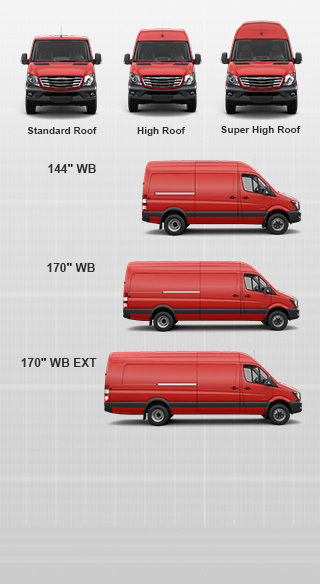 Presenting an expanded lineup of Sprinter WORKER vans. The same performance and the same affordable pricing are now available in new chassis, engine and body configurations, with a Passenger WORKER coming soon.